Time for another fan written story from a fanzine of the 1970's This story was written by Joanna Rakowsi and was published in the January/ February 1976 issue of The Write Thing. It seems that whenever Paul McCartney was in New York, I'd be the only person unaware of the fact. Or I'd take a trip to London in quest of the man and he'd be on a flight leaving the same time -- going in the opposite direction, of course. To make a long story short, I'd say that my luck has been about as good as that of a search party looking for a polar bear in a blizzard. However, on December 24, 1975, my luck took an incredible turn in the right direction. Our editor, Barb, called me at my house on Long Island with some encouraging news: Paul was in the Hamptons for Christmas with his in-laws. So, then and there, Barb and I made a unanimous decision to get the story for "the Write Thing". I promised to visit Paul on Christmas Day and send back some kind of story. Well, to me just seeing Mr. McC, was a story in itself, because I'd been waiting since 1964 for just a glimpse. The next day, my sister Charlene, her husband Joseph and I began the journey of my eleven-year quest, some forty miles of the travel with very nervous stomachs. We had passed the Lee Eastman home many times over the years and simply admired it. It's a typical Hampton home with all the typical trappings, including a TV camera in the hedge which eyes all visitors' cars. We drove silently by several times feeling a bit crestfallen. There were no cars in the driveway and no lights in the house. Finally, we conjured enough nerve to drive into the driveway and ring the doorbell. Yes, we were right, there was no one home. Slightly discouraged, we returned to the car wondering what to do next. We were just about to leave the town when I thought out loud, "No one comes to see their family on Christmas day and then doesn't stay." It occurred to me that maybe the object of our quest if you'll pardon the expression, was visiting with his brother in law, John. Only where does John live? So I went quickly to the nearest telephone booth and the phone directory. Bingo! Same street as his father. Back across town, we went, our spirits high again. Nearly to the end of the street, we came upon a small house with a Christmas tree flowing in the window. On the ground on the sign: John L. Eastman. We decided all we could do was to go to the door and ask and all they could do was tell us to leave. I grabbed the bottle of French wine I had bought as a gift and we hauled out of the car. We were met on the porch by a blonde lady who looked very much like Linda. It was her sister Laura. I squeaked out, "Is Paul here?" in a meager voice. It was answered by a curt, "What?" I repeated my question with a growing apprehension. John stepped out onto the porch just in time to hear Laura repeat another "What?" Either she's very hard of hearing or she was putting me on. "Are you friends of his?" John inquired. Bingo! again. The dead giveaway. "Well, no, we're not actually friends but we have a Christmas present for him." They both disappeared from the porch without another word. No sooner than did John and Laura return to the house than Paul himself appeared, wearing a wine and cream colored smoking jacket and black velvet slippers. At last, my quest was over! I greeted him with a "Merry Christmas, darlin'". We exchanged Merry Christmases twice and I handed him the bottle of wine. Paul took my hand, smiling and kissed my cheek saying "Thanks!" Then he turned to my sister and did the honors. After he had announced that they were just about to "East a bit," motioning absently to the door, I started pouring out every question I could think of without seeming too anxious. "do you have any specific plans for your upcoming album"
"No. I have lotsa ideas," smiling that effervescent smile. No, he's just going in and let "whatever happens, happen." This is going nowhere, I thought. Then the tables turned and he was asking us the questions! "You live around here?" "How'd you know I was here?" The walls have ears, huh? Joanna told him no, New York has ears and the fans in New York told someone in St. Paul, who told her. She said she was a friend of mine and Paul said, "Oh, I remember her." Finally, after some small talk which I only vaguely recall, and seeing that Paul was freezing in the 10-degree weather, we asked permission to take a few pictures. With a hearty, "Oh, sure, yes," as an answer, Joe returned to the car for his camera. Meanwhile, Paul smiled a lot and asked my sister Charlene if we were related, remarking that we look so alike. He was pulling on his blue suspenders with his thumbs. Paul closed his jacket and looked toward the door. "Well, I have to go eat now." We thanked him for coming out into the cold and assured him that we'd be seeing him on the American tour this spring. He grinned knowingly as he opened the door. "Have a happy....rest of Christmas!" These pre-1980 stories are at times hard to wrap our minds around. 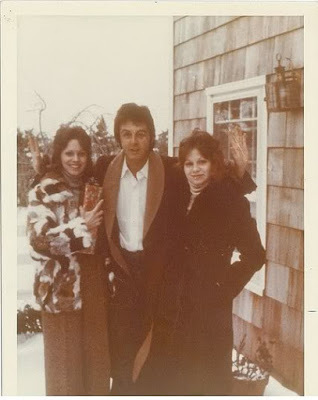 Today no one could ever go to a house where Paul McCartney (or any celebrity for that manner) was staying and just knock on the door and meet him. However --- this is what a LOT of fans did in the 1960's and 1970's. Paul obviously did not mind because he came out and happily took the wine and posed for photos. He appears to be pretty happy in the photos. 99.99% of the fans were/are harmless - but because of the one or two that are crazy and dangerous (and therefore aren't really "fans") make things like this to never happen again. Well, the word "fan" is an abbreviation of the word "fanatic". Just saying.